The chart above is based on data from the USDA showing "Food expenditures by families and individuals as a share of disposable personal income," from 1929 to 2008 (total spending for both "food at home" and "food away from home"). In the entire history of the U.S., it's only been in the last eight years that the percent of income spent on food for Americans was in single digits - since 2000 it's been below 10%. In all previous years, spending on food was in double-digits, and in most years from 1929 to 1952 it was above 20%. 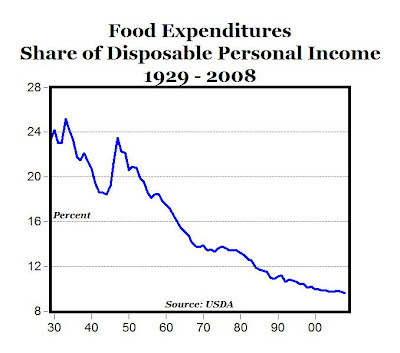 Consider that in 1932, spending on food at home took almost 22% of disposable income, compared to the record low of only 5.6% in 2008. Food has never been more affordable than today, as a share of income. In 2008, despite the "Great Recession," total spending on food as a share of disposable personal income fell to 9.6%, reaching the lowest level ever recorded in U.S. history. And since spending on food as a share of income is lower in the U.S. than in any other country, the 9.6% share of income spent on food in the U.S. for 2008 is probably the lowest ever in the history of the world. This amazing trend in lower food prices as a percent of income reflects first of all the relentless and significant improvements in the production and distribution of food over time, and doesn't even take into account the significant improvements in the quantity and quality of most food products available for today's Americans compared to previous generations (whole, 2% 1%, 1/2%, and skim milk are available for today's consumers vs. whole milk only in the past as just one example). 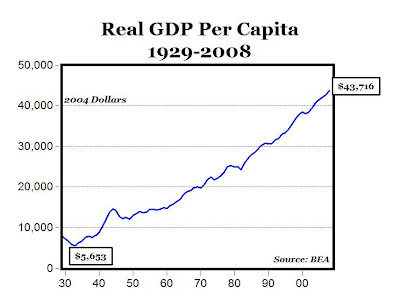 And second of all, Americans are more than 7.7 times wealthier today compared to 1933 based on per-capita real GDP in constant 2004 dollars ($5,653 in 1933 vs. $43,716 in 2008), see chart below. With higher real incomes and lower food prices, it's not surprising that spending on food as a share of income is at an all-time low. And it also makes the comparisons of today's economic conditions and our current standard of living to the conditions during the Great Depression pretty silly, doesn't it? Do govt. subsidies, tariffs, etc. on food have a net effect on pushing prices down or keeping them artificially high? I know certain food stuffs (e.g. sugar) are propped up, but I'm not aware of the overall net effect (or where I can find the data). Also, are low food prices offset (and how much) by the % of (higher) taxes that go into govt. programs specific to food? "And it also makes the comparisons of today's economic conditions and our current standard of living to the conditions during the Great Depression pretty silly, doesn't it?" CNBC reported today that ultra permabear economist Nouriel Roubini, in pretty stark contrast to what he said just a few weeks ago, now suddenly believes the worst is behind us. A little late to the party there, professor! Some of us NON-economist types have known that the worst was behind us a couple of months ago! I agree with your conclusions; however, I would like to see the same graph for lower income households. (For instance, I'd like to see the graph for the four and fifth quintile income level households.) I have little interest in the percentage of food as part of the first quintile's consumption basket, though I don't mind seeing it decline. If the poor are seeing food shrink as a share of their consumption basket, the statements that you have made become even stronger. But, . . . but, . . . . . the ethanol. The Ethaanoowwwl . . . .
Farm Subsidies for the Top 5 Crops are down about $11,000,000,000.00/Yr. Yep, that's right, Bubba. Eleven Billion. That's a rounding error when it comes to Obama's spending. Heck, he gave ACORN almost 4 billion. These food figures demonstrate the awesome power of a growing economy. The curve for real GDP per capita shows the steady, relentless growth. Julian Simon is pleased. What we need is a faster growth rate to make things even better. Socialism and vilification of business by Democrats are a drag on growth. As we get richer, we need less government, not more. Ethanol is generally blamed for a 10% increase in food prices, so taking that out would make the curve that much better. Once more, this is our government hard at work against us. Good intentions, bad result. Much of farm subsidies are to pay farmers to take land out of production. Again, government working against us. No, Tom. CBO says it's about a 0.7% increase that can be attributed to ethanol. Why would you make such a statement? If you look at the chart, you will see that food expense did not dip below the 1942 low until the mid 1950’s. A large portion of the extended dip in food costs is attributable to the relentless rise of low-cost fast-food restaurants that the average American family patronize for both “at home” and “away from home” meals. The quality of such food I will leave for each individual to decide. While quantity and variety are certainly plentiful, the quality of food at the grocery stores is actually below that of decades ago. The fruit and vegetables today are bred for durability in transit, rather than flavor. It was once common to find grass fed dry-aged beef in America. Now, it’s found only in specialty shops at $30-50 per pound for a decent steak cut. How many families can afford that? For another example; I recommend that you taste-test the current corn syrup-sweetened Coca-Cola against the old-school (and more costly) sugar-sweetened Coca-Cola (available in specialty shops imported from Mexico). WillG: there's a whiner in every crowd isn't there? Talk to your grandparents and ask them if they found steaks "common." And, yes if you want an apple in April or a grapefruit in September, then the quality of your produce will be lower. When in season, your fruits and veggies will be sourced locally, or at least regionally, by your grocery store. Of course these are forms of choice for the consumer too. I can't disagree with you on the Coca-cola though. I was waiting for someone to say food is lower quality now. Depends on what you mean by quality. We certainly have a much wider variety of food available now - back in the 50s you couldn't get Mexican, Chinese, Thai or any other ethnic style food in markets, just as an example. To say nothing about choices of organic, vegetarian, vegan or other nonsense fad foods. Food is safer than it has ever been. I don't have statistics, but incidents of food poisoning have fallen drastically over time. Anyone have graphs on that? If all you can get are big, great looking but tasteless fruit, that is because that is what sells. People get what they want in a free market, not what you think they should want. As for corn syrup, why do you think that is cheaper than sugar and so used by Coke? Ask the government. > But, . . . but, . . . . . the ethanol. Yeah, and how much lower still would the prices be if it weren't for THAT crap??? That's not what you were trying to say? Kinda relevant to what you WERE trying to say, innit? > This IS impressive, but it doesn't include the tax dollars going to farmers so they don't charge so much for crops. What alternate reality are YOU from? In *this* reality, we pay farmers expressly to NOT grow crops, which keeps the prices higher, not lower. Welcome to *this* reality, pal! It's not for the animals guys. 2. I'd like to see food spending as a percentage of median household income. And the escalating healthcare bills, that can be attributed to bad eating. Remember E.Coli ? E Coli is not supposed to be fatal bacteria if digested by human because they would not survive the acidic stomach. But only in the past 30 years with the rise of feedlots, new strains of acid resistant E. Coli started to appear. Digesting 10 microbes would be enough to be fatal. Why ? Because we feed the cows the unnatural food and their rumins turn acidic. Mutant E Coli survives in that env. In addition, the acidic env causes ulcers to the cows all the time. To prevent costly illness, cows are constantly fed antibiotic (all USDA approved). So guys, while you celebrate the large quality of food that tricks our million-year evolutionary senses into thinking they are great food, reconsider we humans perhaps create a monster that we as an evolutionary species has never seen before. A local and traditional way of farming may not look systematic and high tech. It actually has built-in safety valve. Industrial food production however, creates a lot of new large scale problem. For example, MacDonald *alwayws* mixes 5000 pounds ground beef together in order to create a consistent taste. This practice opens a door to very serious large scale food poisoning unseen in smaller scale farming/food production. > So guys, while you celebrate the large quality of food that tricks our million-year evolutionary senses into thinking they are great food, reconsider we humans perhaps create a monster that we as an evolutionary species has never seen before. Oh, geez. I'm not even going to debate this idiocy with you. There are certain merits to the arguments about how we feed cattle and such, but a lot of that comes from special rules about exactly how we must feed cattle -- not specifying goals and letting industry decide how to meet them, but exact details about how it can be done, which inevitably ruins innovation and experimentation, since in order to get anything like that accepted you first have to get some idiot bureaucrat with no knowledge of farming, biology, or any relevant science in DC to sign off on it. And since it's no skin off their nose if you lose your shirt thanks to their fiat, but if there's any problems it's a risk to their careers, how often do you think said bureaucrat is going to do anything like that? I recall reading about a process for recycling food/paper waste (i.e., from places like McD's) to turn it into cattle food. Nope, can't be done. It's against FDA regulations. No actual reason -- the piece of paper from the Federal Register just says "no". > This practice opens a door to very serious large scale food poisoning unseen in smaller scale farming/food production. Yeah, because there's millions of cases of those happening every year. Oh, wait. Despite "billions and billions sold", you would be hard pressed to name anything but a minor local case, probably caused by some minwage idiot not doing his/her job right in a single location. The door might be open, but there aren't too many microbes slipping through it. In many places in the world people are spending 50-90% of their income on food, mostly because wages are so low. But there are also people in the U.s. that struggle to buy food (note the increase in people using food banks in the last year). People who make minimum wage, even if they work 40 hours a week only make about $246 gross. Take out taxes, etc and they're down to $200 a week. How do people who make this pay for a sitter if they have kids? Plus, if they are like most Americans they are spending an average of at least $100 a week on groceries. That's 50% of their income. I think that food seems cheaper here because in general we make more money. GDP per person increased vastly. However, average hourly wages were unchanged 1964 to 2008. GDP per person is up but real wages, for example were unchanged 1964 to 2008.